There’s no better way to get over a Bruin loss than with a trojan loss that is more costly to them than the UCLA loss. u$c came into their game at Stanford with a #17 National Ranking, and even though Stanford was #10, the WAY sc lost should cost them a few rungs on the Ranking ladder. u$c backers had been pretty excited about True Freshman Quarterback J.T. Daniels leading troy to their opening week romp over UNLV, but the inexperienced signal caller was exposed in Palo Alto, as sc was completely shut out in the first half, never even reaching the red zone, and then managed only a measly field goal in the second half, as the Cardinal cruised to a convincing 17-3 triumph. Daniels looked green and raw, repeatedly throwing off his back foot. He got sacked 4 times, fumbled, and threw 2 late Interceptions when trying to mount a desperate comeback. Stanford’s Heisman candidate Bryce Love gained 136 yards rushing, scoring on a 6-yard run on the game’s very first drive. Remarkably, that Touchdown not even 5 minutes into the game was all the points Stanford would need to beat sc, and knock them out of the National Playoff Debate for the time being. Watching sc be so inept while losing an all-important CONFERENCE game is nice, but it doesn’t completely erase the tragic events witnessed earlier in the day at Norman, Oklahoma. UCLA started off great, taking a 7-0 lead over the 30-point favorite Sooners, before rolling over and allowing FORTY-TWO STRAIGHT POINTS. Once the contest was thoroughly in hand for OU, the Bruins came back to “win” the final 11 minutes of the game 14-7, making the final score a slightly more respectable, spread-covering 49-21. Of course there is no shame getting pummeled by the #6 team in the nation, in their house, and despite the large margin, the Bruins showed some improvement over their previous loss, at home to Cincinnati. But there was also plenty to be disgruntled about, starting with supposed savior Chip Kelly. The new Bruin Head Coach, who is renowned for his Offensive genius, has NOT been displaying ANY imagination or innovation in his Offensive gameplan or attack. There is virtually no misdirection, or fakes to confuse the Defense. The Bruins constantly ran up the middle on first down, complete with overly telegraphed handoffs, as if Kelly is trying to lull FUTURE opponents into complacency. Oklahoma was controlling the line of scrimmage, but that didn’t stop Kelly from trying to pound the ball into the teeth of the D. It did not work. When Kelly DID call pass plays, they were on more obvious passing downs, so the Sooners pinned their ears back and sacked Dorian Thompson-Robinson SIX times. This was partially due to the vanilla plays and playcalling, where DTR just dropped straight back into a pocket that quickly collapsed. Where were the rollouts? Where were the screen passes? Where were the Draw Plays? Where were the quick slants? There are strategies that negate a strong pass rush, but the Bruins did not employ them. On Defense, the Bruins also started out okay, but then the superior talent of the Sooners took over. Their athletic QB Kyler Murray, and two All-American caliber Wide Receivers, were pretty much unstoppable. Bruin Senior Cornerback Nate Meadors, who didn’t get beat for a Touchdown Pass all season last year, gave up TWO to Oklahoma. Part of that problem was that Murray had ALL DAY to find his targets, because the Bruins couldn’t mount any pressure on him at all. They didn’t sack him once all day. UCLA allowed Murray to throw for 306 yards and 3 TD’s, AND RUN for 69 yards and 2 more TD’s. The Bruin D also committed multiple Pass Interference penalties while trying to stop the bleeding. Just like old times. Even the Special Teams was not immune to getting pwned. The Sooners had several long, field-flipping returns, including an 86-yard Kickoff Return and a 66-yard Punt Return. The Bruins were just out-classed and out-manned in every facet of the game. But that doesn’t mean UCLA didn’t have some highlights. First of all, Dorian Thompson-Robinson showed some flashes that explained why he was such a highly-touted recruit. He did not turn the ball over, he connected on 16 of 26 passes for 254 yards and a TD, and earned a 156.3 Passer Rating (50 QBR on ESPN, compared to 20.3 for J.T. Daniels). He completed a couple of long passes where he laid the ball in perfectly. A 45-yarder down the sidelines was gorgeous, culminated by a fantastic over-the-shoulder grab by Theo Howard. Thompson-Robinson’s effort on Saturday definitely bodes well for the future of UCLA. DTR’s favorite Receiver is Tight End Caleb Wilson, whose 64-yard reception led to UCLA’s first TD. Wilson ended with 4 catches for 92 yards. True Freshman Chase Cota also caught 4 balls, for a total of 45 yards. He showed off great hands, and could easily be hijacking playing time from Christian Pabico in the near future. Bolu Olorunfunmi scored 2 Touchdowns, both on short, tough runs. The last Bruin TD was a 9-yard pass to True Freshman Michael Ezeike. The one highlight on the Defensive side of the ball was a great Interception by Darnay Holmes. The good news is that the Bruins improved from last week. The game was NOT over at halftime (as was expected by many) when the score was only 21-7. The bad news is that the wizardry of Chip Kelly has not been unfurled in the slightest, as the fast pace, misdirection, and QB sleight of hand that constantly frustrated Oregon’s foes have not been in evidence at all. The HOPE is that he is saving that sweet stuff for the conference schedule, holding back on those complexities as the True Freshman QB gets acclimated to college ball, before the playbook gets opened up in full. 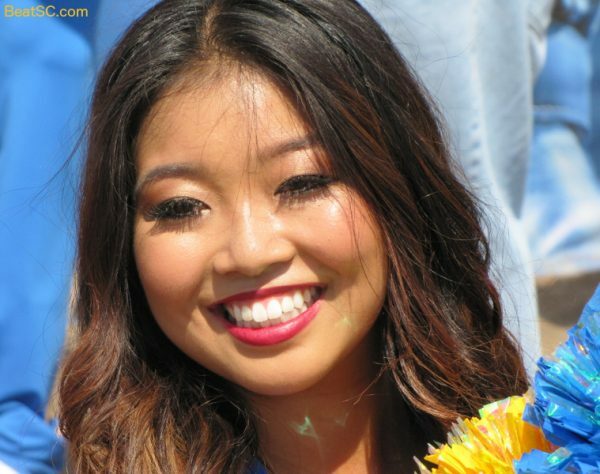 Speaking of wizardry, here are 39 more magical photos of the UCLA Spirit Squad from the Cinci game. 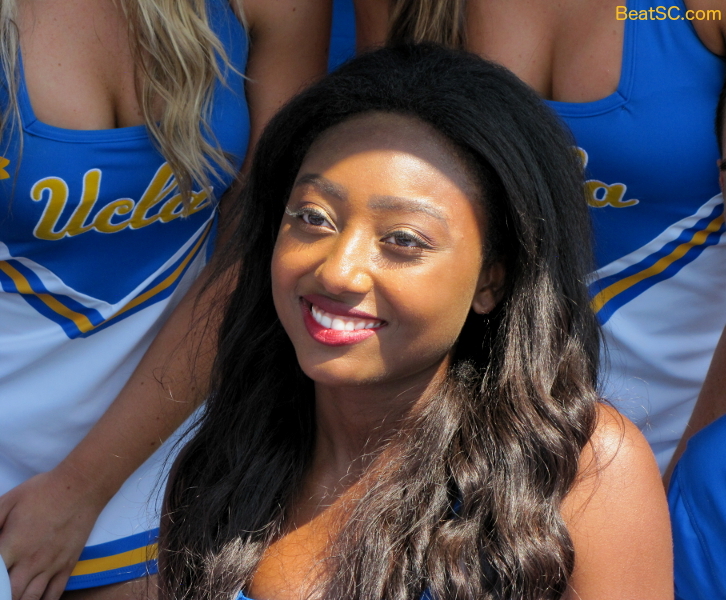 "THINGS GET STORMY FOR DANIELS" was published on September 9th, 2018 and is listed in Blue & Gold News, News from the Dark Side, UCLA/usc/Cheerleader Photos.